What Are the Benefits of Using Goji Juice? Tribulus aquaticus is an aquatic plant belonging to the water chestnut family. In Ayurvedic medicine, it's used for general health, ulcers, pain relief and blood sugar regulation. Research on humans is lacking, so it's impossible to know whether it works for these purposes. The fruit of the plant is commonly eaten in Europe, Asia and Africa and has beneficial nutritional value. Extracts from the fruit and leaf are available as a dietary supplement. Water chestnuts have properties that fight high blood sugar, but it has yet to be evaluated in humans. Researchers used a root extract on an animal model of diabetes with good results. A component of the plant displayed potent anti-hyperglycemic properties, according to results published in the February 2014 issue of the Journal of Ethnopharmacology. It shows promise as an alternative treatment for high blood sugar, according to the authors, but more research is needed. Scientists uncovered water chestnuts' pain-relieving properties, but again, these have not been evaluated in humans. The Journal of Current Pharmaceutical Research published findings in its January 2010 issue. Researchers found that substances in water chestnuts exhibit significant pain-relieving properties in two ways: by reducing inflammation and by suppressing the central nervous system's pain signals. The authors assert that water chestnut may provide a safer alternative to opiate-based painkillers. Water chestnuts have a high nutritional value, according to "Edible Medicinal and Non-Medicinal Plants" by botanical researcher Tong Kwee Lim, Ph.D. 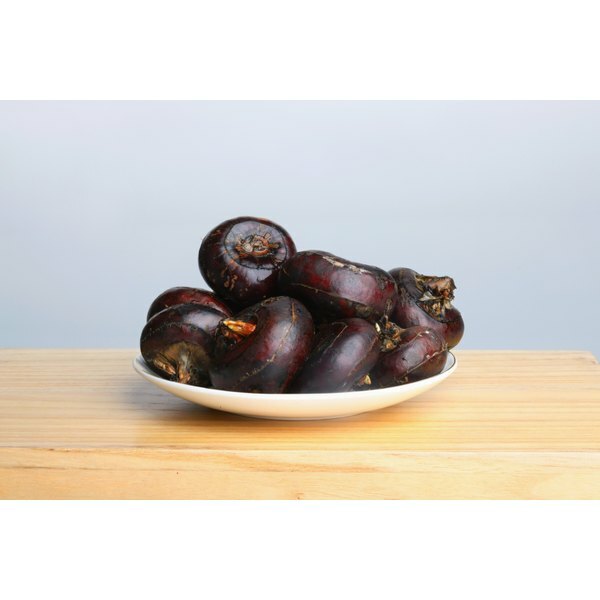 He writes that water chestnuts are particularly rich in minerals like calcium, zinc, potassium, copper and magnesium. They're also rich in certain B vitamins like riboflavin, B-6 and folate. As far as macronutrients, the fruit of the plant is composed mostly of carbohydrates, but it also contains some protein and fiber. Water chestnuts are considered both a nutritional food and a medicinal plant, writes Lim. Work closely with your physician if you plan to take tribulus aquaticus to treat diabetes or any other condition. Taking it with blood sugar-lowering medication increases the risk of hypoglycemia, which is when blood sugar drops below normal. Your doctor may need to adjust your dosage of medication accordingly. No serious side effects related to taking tribulus aquaticus have been reported. Safety and efficacy has not been adequately studied in humans, so unreported side effects are possible. What Are the Benefits of Ampalaya Tea? What Are the Benefits of Yacon?